Mauser M 84/98 carbine. Serial number 9503 c on ricasso. Excellent fullered blued blade. German maker's name MUNDLOS on ricasso. Date 38 on blade spine. Excellent blued pommel and crossguard. Two crisp waffenambt stamps on pommel. Flash guard. Excellent deep brown composite grips secured to the blade by two screw bolts. 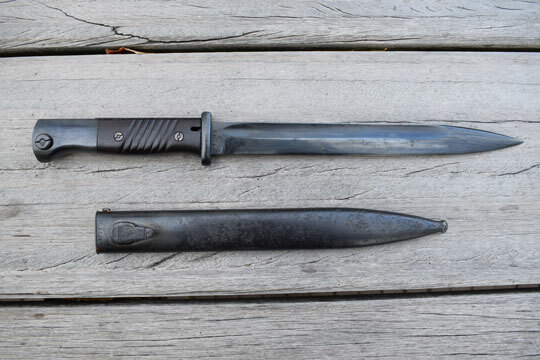 Deep blued metal scabbard with no dents is not matching, but marked MUNDLOS 38 and 3265 serial number. Scabbard body with peppering to light pitting.